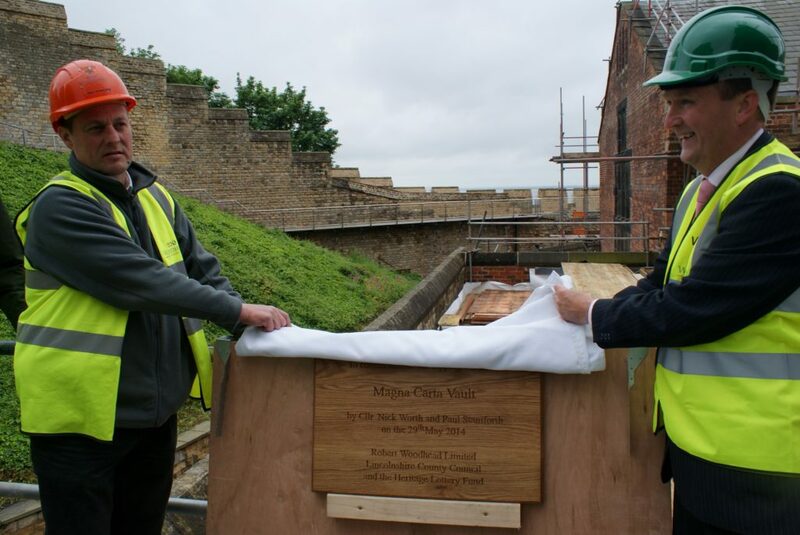 This Thursday Lincolnshire County Council and Woodhead held a ‘topping out’ ceremony to mark a major milestone in the Lincoln Castle Revealed project – the construction of the Magna Carta vault. The construction company’s specialist heritage team (Woodhead Heritage) has been working for the council on its Lincoln Castle Revealed project for the past three years. Now in its fourth and final phase – the restoration of Lincoln Castle Prison – the £19.9m project is preparing a new home for its most treasured artefacts, Magna Carta (1215) and the Charter of the Forest (1217). Councillor Nick Worth, Executive Member for Culture and Heritage, said: “Lincoln Castle will be the only place in the world where Magna Carta and the Charter of the Forest can be seen together. “It will also be the only place to have a dedicated new building and exhibition to celebrate the 800th anniversary of the signing of the Magna Carta in 2015. Security around the documents is of paramount importance. As part of the new design, Woodhead Heritage has built a subterranean vault within the confines of the Lincoln Castle Prison building. The vault which will be the new home of both historic documents is built to very high security standards. The state-of-the-art subterranean vault, designed by the architects Arrol & Snell in conjunction with RAA Associates Interpretation Designers, maintains environmentally-controlled conditions, keeping the documents preserved, while allowing visitors to view them together. Simon Butler, Conservation Manager for Woodhead Heritage, said: “We have been working on the Lincoln Castle Revealed project since it began, and the completion of Magna Carta vault puts us one step closer to completing this unique project for Lincolnshire County Council. Woodhead also completed Lincoln Castle’s award-winning sustainable Heritage Skills Centre, Also designed by Arrol & Snell, and continues to work on the ongoing conservation of Lincoln Castle walls. At Thursday’s ‘topping out’ ceremony Lincoln Cathedral also launched a brand new book commemorating Lincolnshire’s strong connections to Magna Carta. Written by Carol and Nicholas Bennett, Magna Carta, the Lincoln Story focuses on historical characters and events from Lincolnshire’s history that had a part in the signing of Magna Carta. The publication looks at key figures such as Stephen Langton, the Archbishop of Canterbury, who was known as the ‘chief architect of Magna Carta’, originally from Langton by Wragby in Lincolnshire. It also features the Bishop of Lincoln, Hugh of Wells, who was present at Runnymede, and set up the first system of record keeping in any English diocese. It is thanks to him that Magna Carta survives today. These are just a couple of the fascinating connections between Lincolnshire and Magna Carta that are reflected in the new book, published by Pitkin and Lincoln Cathedral publications. This weekend members of the public will have the chance to take part in exclusive behind-the-scenes tours of the conservation work at Lincoln Castle’s 1,000 Years of Traditional Crafts event. Woodhead has sponsored the event this year. The company will be taking members of the public on behind-the-scenes tours of the work to the Castle Prison, showing visitors the traditional skills and techniques used in the restoration of the building. Booking on the day is essential as numbers are limited and restrictions apply. The event will host more than fifty traditional craftspeople, sharing their skills and knowledge, from blacksmithing, pole lathe and willow weaving to stonemasonry, jewellery-making and silver smithing. Visitors will be able to stroll around the special demonstration areas and also have-a-go themselves by trying their hands at some of the crafts being displayed in the Castle grounds.